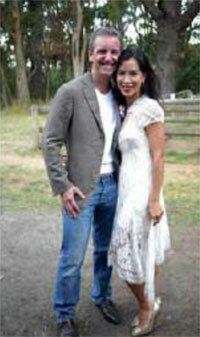 Crystal Lim: From posh urbanite to farm girl. A former banker took time out to make a different kind of investment – in herself. In doing so, she soon found a way to help others and bring more love into her life. In this age of fast and busy lifestyles, walking the work-life tightrope is a perennial challenge. Crystal Lim Leahy should know. Four years ago the former banker and her husband Mark were living in Singapore, both deeply entrenched in their work, with little time for each other, much less for their three young children. "We realised we needed to take a break and reconnect with each other and the kids," she says. The couple attended the Hoffman Process in Byron Bay, Australia, an intensive retreat described as "eight years of therapy in eight days". It was cathartic, powerful, and effective. "It made a huge difference to our lives," she says. "it changed the way we communicated with each other." The experience profoundly affected them and prompted them to leave the financial security of their lives in Singapore for a sabbatical in rural Victoria, Australia. They bought a small vineyard and farmhouse in the countryside. "we had to get back to basics," says Lim Leahy. "it was completely different to the life we'd left behind but it was the change we needed." The couple's life-changing experience in Byron Bay had also got them thinking. "what if we could create a programme that was as powerful, deep and profound as the Hoffman Process?" she says. "What if we did it in a way that was completely nurturing, more holistic, gave people more time for themselves, and on a shorter schedule to suit time-poor people?" Two years later and Lim Leahy is the founding director of Legacy Retreat, a five-day programme of mindfulness, emotional healing and spiritual awareness. Health and wellness retreats have become increasingly popular but a truly holistic wellness retreat is more than just yoga classes and some massage treatment. Lim Leahy believes that instead of a vacation from the stresses of everyday life, this type of retreat should be a catalyst for a new way of living. Now in their second year of operations Legacy helps people rebalance, find space and clarity, and discover a more meaningful way of living. While other retreats and wellness spas offer a dizzying array of programmes, Legacy prefers a holistic approach because issues manifest themselves in all kinds of ways and its not as simple as just treating one area. This means that every programme is synergistically designed, and all their therapists work together and communicate with each other about each client. The location of the retreat also plays a special importance to the Legacy experience. After so much international travel in their previous jobs, Lim Leahy and her husband had a good idea of the type of venue they wanted. "It was important we had somewhere serene and tranquil with a certain spiritual energy" she says. "The kind of work we are doing is powerful exploration of self, and the surroundings are a big contributing factor." 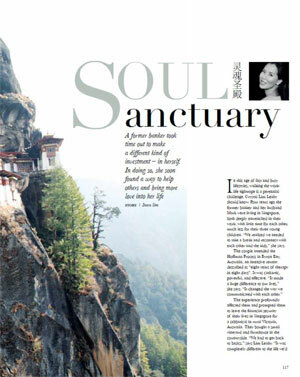 The retreats have gone to Bali, Vietnam and Australia in the past, but Bhutan is 'home' for Legacy at the moment. 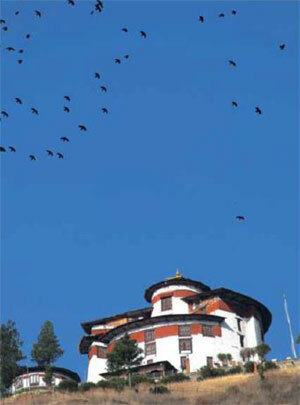 "Bhutan has a special energy, we're cradled by the Himalayan ranges and you feel safe and supported by the mountains. The weather is crisp and cool, and there is a certain emotional clarity you get from that." So can a wellness retreat really change your life, and is five days enough to do it in? Lim Leahy insists the retreat is not designed to "fix" everything over a long weekend, but to refocus your outlook and give you the tools to live a better life. "We give you a map of your life, and the design of the cage you have built that is holding you back," she says. "you have to fashion the key for yourself"
© Copyright 2011 - 2017 legacyretreat.com All rights reserved.